To view information about the Wichita Downtown Bookstore, go to www.cowleycollegebooks.com. We have an onsite computer lab that is open to students during regular operating hours. Signs will be posted in advance if the computer lab will not be available. 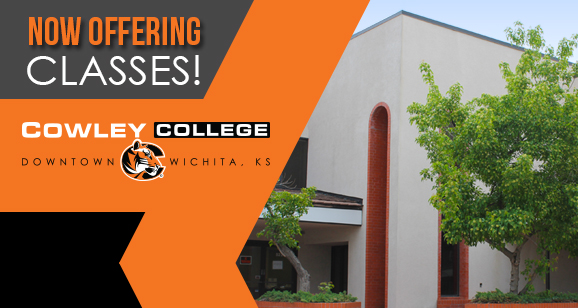 You are able to request and pay for academic transcripts of the courses you have taken from Cowley. For more on transcript requests please visit the Registrar’s website. Our staff is trained in basic financial aid procedures and can answer many of the common questions you may encounter during the financial aid process. If you need more detailed financial aid help…have no fear because we have a fully staffed Financial Aid office on our main campus that is simply a phone call away! Advisors are on site to help you determine which academic major or career you are looking to pursue. We work with you to enroll in classes that meet your goals and are scheduled in convenient times and locations. Advisors will enroll students for classes held at any location and online! Through the career tools provided by the Discover program and the advice of our advisors, we are able to help you narrow down and select a major that fits your personality and career goals. We have computers dedicated to helping you discover which levels of math and English courses you are ready to take. Paying for your classes has never been easier. Now you can stop by the center to pay for your tuition and fees or visit with one of our advisors about our convenient online payment plan.